The Montgomery Old Testament Bible with the message "Field Marshal Viscount Montgomery, GCB, DSO, the gallant leader of the victorious forces by whose hand God has placed salvation in Zion in the days of El Alamein presented in token of the everlasting gratitude of Palestine Jewry by the Vaad Leumi, General Council of the Jewish Community in Palestine". 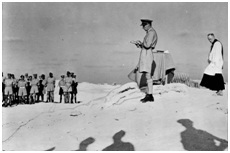 Field Marshal Montgomery commenced prayer meetings when he arrived in Egypt. His father was a Bishop in Tasmania. 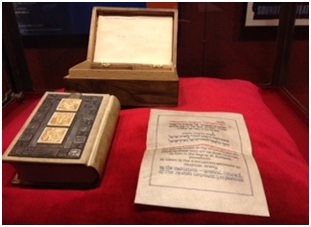 (d) the words on the inscription, attached to the Bible which is the Tenach, or Old Testament, and encased on the cover in silver and mother of pearl are: "Field Marshal Viscount Montgomery, GCB, DSO, the gallant leader of the victorious forces by whose hand God has placed salvation in Zion in the days of El Alamein presented in token of the everlasting gratitude of Palestine Jewry by the Vaad Leumi, General Council of the Jewish Community in Palestine". (d) extends its congratulations to Kelvin Crombie on his book's initial launch in the House of Lords in London on 7 November 2012, and on the Australian launch in Sydney in the New South Wales Parliament House Theatrette on 26 November 2012. 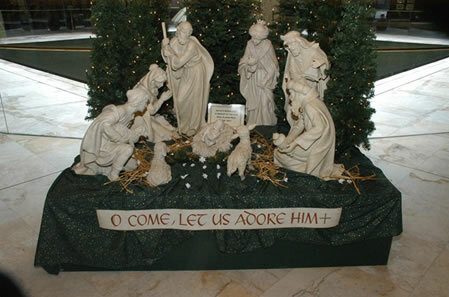 The Evangelical Sisters of Mary placed this Nativity scene titled "O Come let us Adore Him" on Monday 26th November 2012 in the foyer of the NSW Parliament. Christian Heritage Sunday will be on Feb 2nd 2014. Almost 200 years ago the Gospel arrived on the shores of New Zealand. Read what's being done to commemorate this event.